As many already know, Jake, my best bud for over 10 years was put to rest. I can't believe it's actually been two weeks. He was such a part of me. To those that have had or have pets, you know what I mean. Ironically, he was a Christmas gift from my ex, and he was such a comfort and friend to me when that relationship ended. I remember the day I got him. His ears were so long, he'd trip on them- the most adorable sight you've ever seen. All of the nieces and nephews were there b/c of it being Christmas, so they all helped come up with his name. It seemed to fit, so from then on he was Jake. Through the years, he acquired many nicknames from friends and family: "Jake-a-roo", "Jakers", "Jakester", "loverdog" (that's mine), and the last one from my wonderful husband, "Spooky"; because he was always afraid of everything, esp. the vacuum cleaner and fireworks. Jake has always been in Gainesville, but he went with me to Arizona when I traveled. He was a great travel partner and buddy while I was there. I couldn't have imagined leaving him behind. He was spoiled; he got to sleep on my bed or the couch, always had great walks, good play mates and treats, treats, treats. He got bumped from the couch and bed once I got married. But, he did get to stay inside, b/c that was the deal before the proposal. I am so glad he hung around to meet David and Daniel. They have enjoyed him so much and he's been very tolerant of them, as they bombarded his world. He was diagnosed with lymphoma April 26 and became very sick quickly. I prayed that the Lord would take it from my hands but he had more and more trouble walking and was losing more weight. His eyes seemed so empty and he wasn't the dog I used to know. I felt so sad to be losing him but I made the decision to help him and take away any pain he might feel. I was being selfish to ask God to take him quietly in his sleep. I knew I'd have to be strong because I couldn't bear to see him get more sick or hurt from the pain. The moment he took his last breath, I held him and sobbed like a baby. The pain was wretching. I prayed he could hear me tell him I loved him. 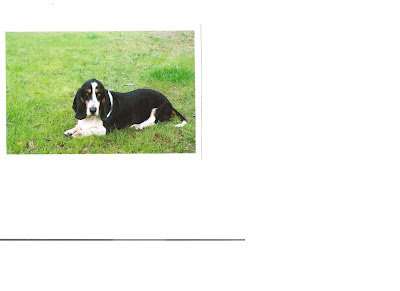 He was a beautiful bassett who showed me great love. I will miss him dearly. I am so saddened to hear about Jake. Know that you did the best thing for him and that you loved him well. It is not easy to let go of them, but keep his memory close! Sweet Jake. I'm glad you had so many good years with him - that is special and you will always remember them. It is never easy, but you gave him a good life and I bet he felt loved to be part of the proposal agreement! Thank you for sharing this Julie - he'll always have a special place in our hearts.